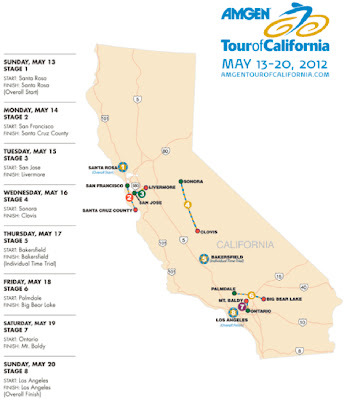 Amgen Tour of California May 13-20, 2012 There will be 8 stages in 2012. The Tour begins in Santa Rosa, CA and ends in Los Angeles, CA. Read more about the Host Cities for 2012. Typically on the morning the stages of the Amgen Tour of California are announced, I rush to my computer happy to make my hotel reservation for the race's Individual Time Trial stage. I was stopped in my tracks this morning when I read the time trail in 2012 will be in Bakersfield, California. What? What happened to beautiful peaceful Solvang? I immediately thought, what did we do as fans to deserve a time trial in Bakersfield? 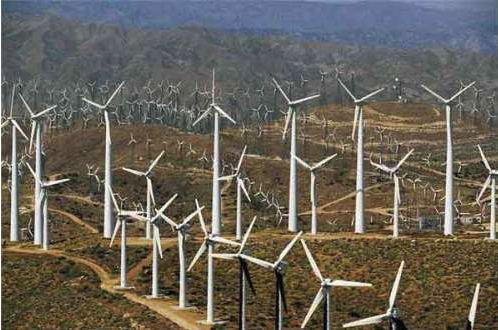 My 2 impressions of Bakersfield, CA: wind mills and oil fields - I am sure one or the other will have an impact on an ITT. I love the Tour of California, I love being a fan at the tour, and I am a faithful attendee, but the idea of looking for a hotel near Bakersfield, quite frankly frightens me. The week I follow the Tour of California every year is my vacation time. There are numerous beautiful locations throughout (my home state of) California, the selection of the host cities of San Francisco, Bakersfield, Ontario, and Los Angeles do not speak to the natural beauty of my beloved state. These locations more clearly speak to those cities which were fiscally capable of supporting the race this year. These are working cities. Although I find the locations of the stage starts and finishes this year to be a bit odd as a fan, I am happy this race still exists and will be there as a fan to give support and cheer like mad. 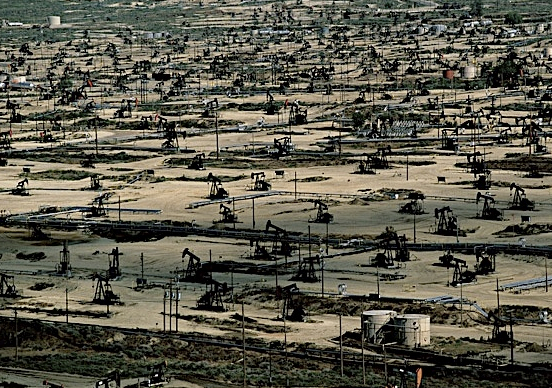 I might also drive into Bakersfield, and drive out. Also when tour organizers use larger cities (San Francisco, Los Angeles) or tourist cities (Santa Rosa, Santa Cruz, Big Bear) in California, the cost of hotel rooms rise, or the distances needed to drive to the event increase. I always enjoy the smaller towns much more. 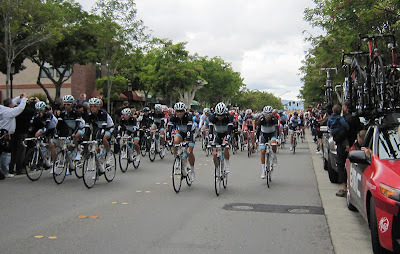 The ATOC route in 2012 may be a harder one to chase as a fan, but I remind myself I always enjoy being there; the race is always worth attending. I hope this route does not send the riders begging to spend three weeks suffering through the Giro in place of spending the evening in Bakersfield and Ontario. But I would understand. At least the Amgen Tour of California is only 8 days of racing and California is lovely in May (at least now that they have eliminated the possibility of the freezing snows of Lake Tahoe). Still I long for the days spent lingering as a fan in Santa Barbara, San Luis Obispo, Paso Robles, Claremont, and Solvang! 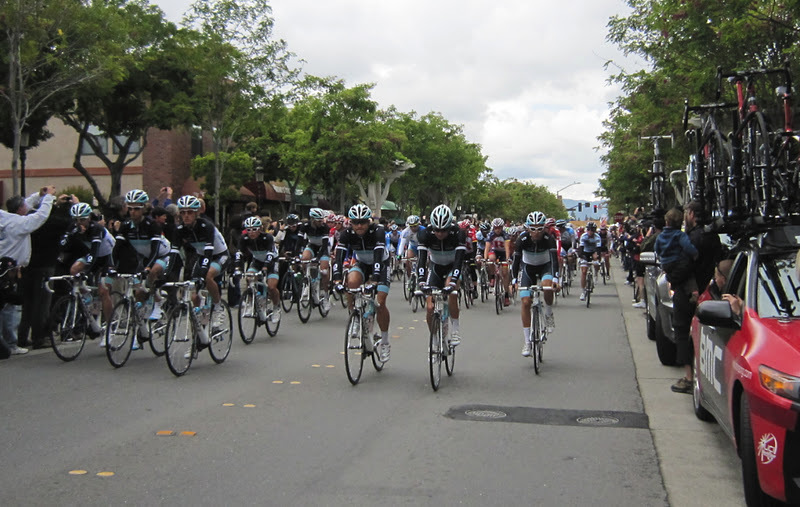 The stage I am excited about in 2012 is Stage 3 from San Jose to Livermore. These two towns were host cities last year and did a great job. I also like the city of Palmdale very much (last visited in 2010) for a stage start, and of course Levi Leipheimer will be so happy to have his home town of Santa Rosa as the base for the start of the 2012 Amgen Tour of California. 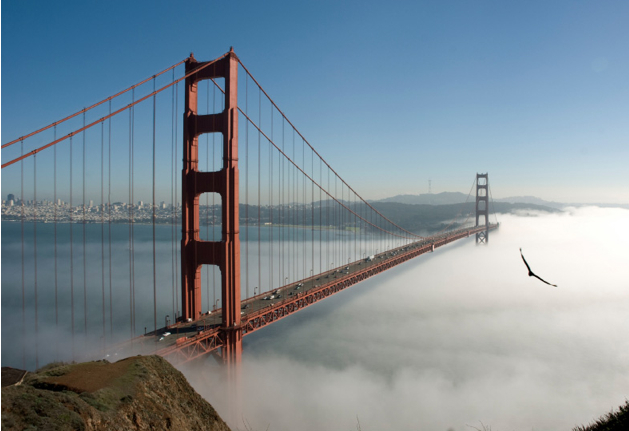 The expensive (but beautiful): San Francisco, Santa Cruz, ($150- $350 a night hotel rooms). 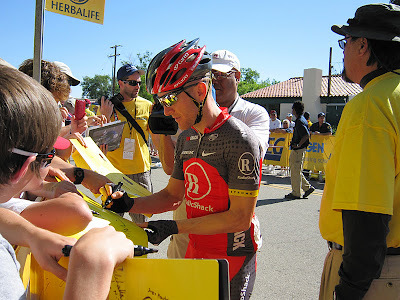 Read some early posts by PedalDancer.com about the Amgen Tour of California over the years.